Vallesaurus is an extinct genus of Late Triassic elyurosaur drepanosauromorph. First found in Northern Italy in 1975, it is one of the most primitive drepanosaurs. V. cenenis is the type species, named in 2006. A second species, V. zorzinensis, was named in 2010. The first specimen of Vallesaurus cenensis, MCSNB 4751, was found in 1975 by the staff of the Museo Civico di Scienze Naturali of Bergamo, Italy. The genus was named in respect of professor Valle, the former director of the museum. 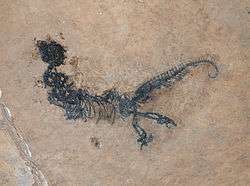 The species, on the other hand, was named after a local municipality called Cene neighbouring the site where the fossil was excavated. The specimen was given to palaeontologist Rupert Wild to study at the Staatliches Museum of Stuttgart, Germany. Wild named the genus and the type species in 1991, but without describing it formally or providing the holotype specimen. Pinna (1993) provided the holotype and described it but the name "Vallesaurus" was considered a nomen nudum. Renesto and Binelli named formally the genus and the type species in 2006. The second species, V. zorzinensis, was found in the same location and identified from the specimen MCSNB 4783. The specific name referred to the Zorzino Limestone Formation, where the holotype was found. Vallesaurus is a small drepanosaurid about 15 centimetres (5.9 in) long. It is pentadactyl, with the 4th digit being longest and equal in length to the humerus. Its tarsus has a centrale, or an ankle bone which articulates with the tibia. In addition, Vallesaurus also has modified distal tarsals and metatarsals, and a clawless hallux. Vallesaurus differs in some characteristics from another drepanosaur, Megalancosaurus. Vallesaurus has a proportionally shorter and higher snout, a thicker and larger maxilla and set of maxillary teeth, and a shorter cervical vertebra. It also lacks the fusion between the neural spines of the second and third dorsal vertebrae. Vallesaurus differs from Drepanosaurus, another drepanosaur, in that it lacks the enormous claw found on the second digit of the manus. It can be distinguished from Drepanosaurus, Megalancosaurus and possibly Dolabrosaurus in the lack of a terminal spine at the end of the tail. In addition, Vallesaurus also differs from Hypuronector, a related drepanosaur, in having anteroposteriorly extended neural spines of the anterior dorsal vertebrae and forelimbs much shorter than the hindlimbs. 1 2 Silvio Renesto; Justin A. Spielmann; Spencer G. Lucas & Giorgio Tarditi Spagnoli (2010). "The taxonomy and paleobiology of the Late Triassic (Carnian-Norian: Adamanian-Apachean) drepanosaurs (Diapsida: Archosauromorpha: Drepanosauromorpha)". New Mexico Museum of Natural History and Science Bulletin. 46: 1–81. 1 2 3 Renesto S. & Binelli G. (2006) “’’Vallesaurus Cenensis’’ Wild, 1991, A Drepanosurid (Reptilia, Diapsida): From the Late Triassic of Northern Italy”, Riv. It. Paleont. Strat. 112: 77–94, Milano.